Vehicle is equipped with: 4-Wheel Disc Brakes, 6 Speakers, ABS brakes, Air Conditioning, Alloy wheels, AM/FM radio, Auto High-beam Headlights, Automatic temperature control, Brake assist, Bumpers: body-color, Delay-off headlights, Distance-Pacing Cruise Control, Driver door bin, Driver vanity mirror, Dual front impact airbags, Dual front side impact airbags, Electronic Stability Control, Exterior Parking Camera Rear, Fabric Seat Trim w/SofTex, Four wheel independent suspension, Front anti-roll bar, Front Bucket Seats, Front Center Armrest, Front reading lights, Fully automatic headlights, Illuminated entry, Knee airbag, Leather Shift Knob, Low tire pressure warning, Occupant sensing airbag, Outside temperature display, Overhead airbag, Overhead console, Panic alarm, Passenger door bin, Passenger vanity mirror, Power door mirrors, Power driver seat, Power steering, Power windows, Radio: Entune 3.0 Audio, Rear anti-roll bar, Rear reading lights, Rear seat center armrest, Rear side impact airbag, Rear window defroster, Remote keyless entry, Security system, Speed control, Speed-sensing steering, Split folding rear seat, Spoiler, Sport steering wheel, Steering wheel mounted audio controls, Tachometer, Telescoping steering wheel, Tilt steering wheel, Traction control, Trip computer, and Variably intermittent wipers. 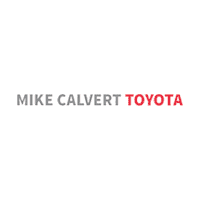 Mike Calvert Toyota has been here in Houston for 35 years. Family owned and operated we have again been Nationally Recognized for outstanding Customer Service, Sales and Service. From the moment you contact us, you'll know our commitment to Customer Service is second to none. We strive to make your experience with Mike Calvert Toyota a good one - for the life of your vehicle. Whether you need to Purchase, Finance, or Service a New or Pre-Owned car, you've come to the right place. It will be a pleasure to serve you.